Moses was the youngest child of a Levite couple, probably called Amram and Jochebed. He was born at a bad time. The Jewish population in Egypt was growing too rapidly for the Pharaoh’s comfort, and he decided to set in motion one of the many pogroms the Jews have faced throughout their history. He ordered that all male Jewish babies be killed at birth – this would control their population growth. Moses’ mother hid her new baby for three months and then put him in a papyrus basket and pushed the little Ark out onto the Nile river. She could do no more for him, she decided, and God would decide his fate. The little basket floated for a while, then lodged in the shallows of the river. The baby’s sister Miriam had been following, and saw that it was not far from a bathing party – one of the Pharaoh’s daughters was there with her retinue. The women saw the basket and investigated, finding a live baby, probably crying with hunger. 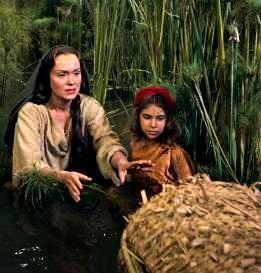 In the confusion that followed, Miriam stepped forward and offered to find a wet-nurse for the baby. The woman she brought forward was Moses’ own mother. The little baby was then adopted by the royal women. Moses was brought up in the court – thereby receiving an excellent education and gaining the sort of social contacts that would give him the confidence he would need later in life. Moses grew up. Did he have any inkling of his cultural roots? Probably yes. 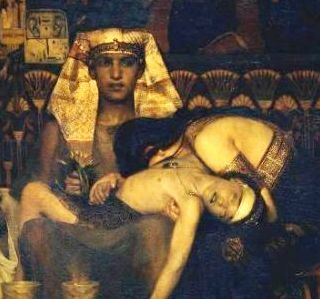 The princess who adopted him would have had a good idea of why a healthy baby had been cast out onto the river in the first place, and Moses probably resembled his Jewish forebears rather than the Egyptians he lived with. One day Moses sided with a Hebrew being beaten by an Egyptian, and in his anger he killed the Egyptian. 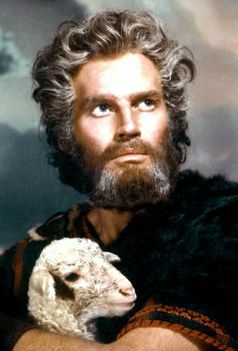 The penalty for this crime was severe, so Moses avoided capture and headed out into the desert, where he lived as a shepherd. He married and became a father, his father-in-law being the priest Jethro. The historical background of what happened next is unclear, since it is virtually impossible to date the story accurately in Egyptian history. 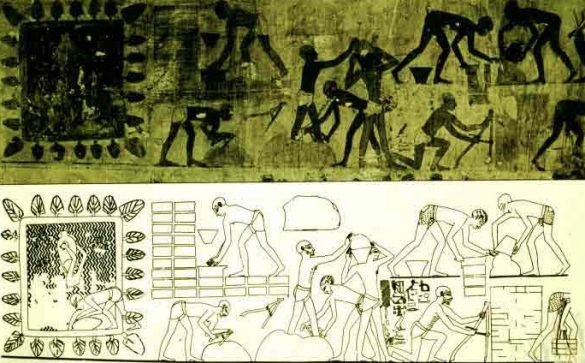 In any event, there was a mass movement of the Jewish people out of Egypt – caused, the text suggests, by impossibly difficult working condition imposed on the Hebrews by the Egyptians. According to the Bible story, it was Moses who led this movement. 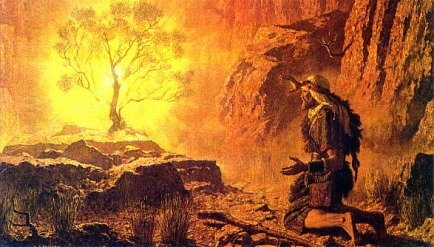 In a vision, Moses saw God in the form of a burning bush. God commanded Moses to ‘bring my people out of Egypt’. When Moses pointed out that this might not be easy, God revealed his identity – ‘I Am Who I Am’ and gave instructions on how Moses should proceed. He also gave Moses the power to perform miracles, and the one thing that Moses knew he truly lacked – eloquence. Thus fortified, Moses returned to confront Pharaoh. During this last plague, the death of every firstborn, the first Passover was celebrated by the Hebrews. It is seen as a seminal moment in Jewish, and biblical, history. Under the barrage of misfortune and plague, Pharaoh conceded defeat and agreed to let the Hebrews go. They left Egypt, following a pillar of cloud – God in earthly form. The pillar appeared as a cloud by day and a pillar of fire by night. They were led by Moses and his brother and sister, Aaron and Miriam. 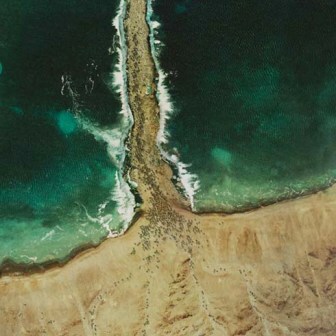 God’s eye view of the parting of the Red Sea! But Pharaoh regained his composure and pursued them, triggering another disaster – the drowning of his army in the Red (Reed) Sea. The Songs of Moses and Miriam are triumphal chants composed around this event. Then began the long wandering in the desert, where for several generations the Hebrews returned to being what they once had been, in Joseph’s time: nomadic herdsmen. 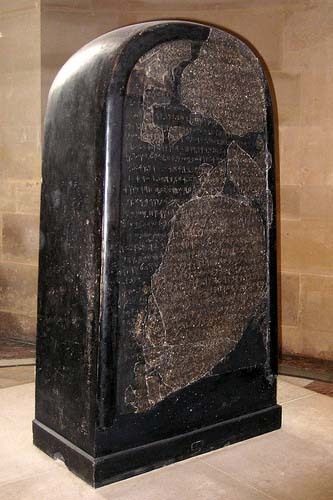 Eventually they came to Mount Sinai, where Moses received the inspiration to formulate the Ten Commandments. These were a set of laws that gave shape and direction to the people. See ‘How To Get To Heaven’ for a modern reworking of the Ten Commandments. He also codified laws around Hebrew worship and ritual, the treatment of slaves, property, restitution, violence, social and religious laws, the annual festivals and the sabbatical year. This complex system of laws would serve the Hebrews throughout their history. Moses was focused on the God he had found (or who had found him) but the people were not. They remained loyal to many of the ancient gods of fertility and agriculture, and were reluctant to abandon them. In the desert they continued to worship a god of plenty who they imaged as a a young calf. 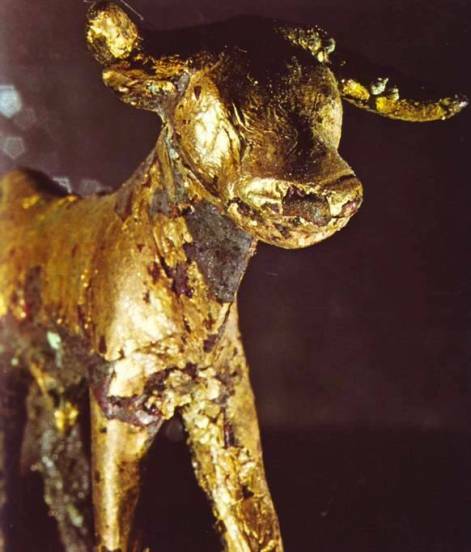 While Moses was away in the mountains they designed and made a golden image of this god, probably Baal, and worshipped it with orgiastic rituals. When Moses discovered what they had done, he was furious. He smashed the image and forbad them ever to worship in this way again. He also commanded the people who had remained loyal to ‘I Am’ to slaughter those who had reverted to worship of the Calf – which they did. The Covenant between God and his people was now sealed in blood. The authority of Moses’ brother Aaron now declined, and he was replaced by Joshua. He was a military leader and excellent judge of people, and he was eventually consecrated as Moses’ successor. The group of Hebrews moved northwards into Canaan. The land was already settled and well defended, but the less desirable hill country was a possibility. This is where the Hebrews, now the first Israelites, would put down roots. Moses was not to see this happen. He died on the borders of the new land, in the land of Moab – but his work and faith produced a people who remembered not only slavery in Egypt, but freedom under God.